[MARCH 17, 2000] Logan County voters will decide Tuesday whether to approve a new tax that will raise an estimated $94,000 to help support organizations that benefit senior citizens. The referendum, which will be on all county ballots, asks if the Logan County Board should impose a tax “not to exceed .025 percent” of the equalized assessed valuation of taxable property in the county. According to the Oasis Senior Center, this one-quarter of one percent tax increase would amount to an additional $5 to $7 per year for the average Logan County homeowner. A homeowner with property assessed at $75,000 would pay about $6.25 more in taxes, and if the home is owned and occupied by a senior citizen age 65 or older, the tax would be only $4.87. The land tax would be six to eight cents per acre for unimproved land and slightly higher for other land, according to Oasis projections. Although the Oasis Senior Center is the only organization which has actively researched and promoted the referendum, the tax increase would benefit not just Oasis but other Logan County senior services as well, said Judy Donath, executive director of the Oasis Senior Center. "The county board has made it clear that this is not just an Oasis tax," Donath said. "The board will decide which organizations will receive the new tax dollars. However, we feel it is logical that the Oasis Senior Center should benefit from this tax." Groups such as Meals on Wheels and Community Action Transportation Services would no doubt submit proposals for funding if the tax increase passes, she said. She also pointed out there are active senior groups in Atlanta and Mount Pulaski which would also qualify for funding. According to the wording of the referendum, the purpose of the new tax is to provide social services "designed to prevent the unnecessary institutionalization of elderly residents, or for the operation of, and equipment for, senior citizens centers providing social services to elderly residents, or to provide transportation vehicles or services for senior citizens." Oasis spearheaded the project because "we are forever having to sponsor fund-raisers to pay our bills," Donath said. The Oasis budget is roughly $90,000 per year. The organization receives about $10,800 from the United Way and must meet the rest of its budget by sponsoring various fund-raisers such as card parties and chili suppers. "Last May, in order to keep operating, Oasis had a fund drive that brought in over $20,000. It would be wonderful to have a stable, known income," Donath added. If the referendum passes, Donath sees several projects which would immediately benefit from the increased funding. "Our 1988 van is in dire need of repair or replacement," she said. The van is used to transport seniors to plays, shopping and various area attractions. It might also be used to being seniors from outlying communities to Oasis for the day or to furnish transportation to someone who needs social security or health services, she said. The Home Alone project is another service Oasis would like to expand. At present the program consists of telephone calls to seniors who are unable to leave their homes. Donath would like to schedule regular visits to these homebound seniors. Oasis, which opened its doors on May 5, 1985, has more than 500 seniors on its mailing list and several hundred active members, according to Donath. "This is a place for seniors who may be alone and want an enjoyable place to come. It brings people together. People can come here and feel safe and welcome and also get a good meal for only $4." Oasis offers a number of recreational and educational programs, including craft and computer classes, card games, bingo, quilting, blood pressure and hearing screenings, programs on nutrition and diabetic diets, information about senior health insurance, and social security assistance. [MARCH 17, 2000] Bob Wood, chapter director of the Logan County Area Christian Coalition, has announced that Christian Coalition Voter Guides will be available in the Logan County area to distribute on Sunday, March 19. This week the Illinois Christian Coalition began the distribution of 500,000 voter guides for the March 21 primary. "Our people set a goal of one milllion voter guides this year, and we will be over halfway there with just the primary. God has blessed us! 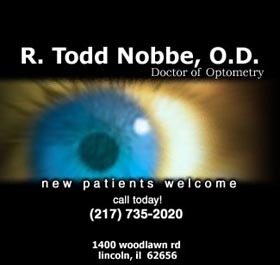 I think anyone can see that," said John Dickey, ILCC executive director. The Primary Voter Guides are educational, based upon voting records and registered surveys. "An effort was made this year to consolidate the effort of several pro-family values organizations into one unified effort," Dickey explained. The voter guides are non-partisan, as always, and they include valuable information on the competitive races across the state. 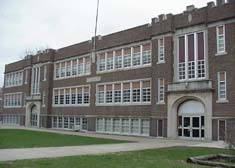 [MARCH 16, 2000] In an unexpected move, Lincoln Elementary School District 27 school board voted Wednesday night to rescind last month’s decision to renovate Central Elementary School and to approve replacing both Central Elementary and Lincoln Junior High School with new facilities. The change in plans came after Superintendent Robert Kidd reported that he had received little support from the Lincoln City Council for permission to move a 6-by-6 foot city sewer line that runs across Ralph Gayle Field. The sewer would have to be moved before the school district could complete its original plan to build a new school on that site. Although the City Council meeting held Tuesday evening was a work session and no official vote was taken, Dr. Kidd said there did not appear to be support for moving the sewer, but instead appeared to be opposition. He said aldermen opposed changing the big walk-in sewer line that was functioning well and also cited opposition from constituents who want to keep Ralph Gayle Field as open space. After hearing Kidd’s report, board member Bruce Carmitchel moved to rescind the motion to renovate Central School. A second motion was made to adopt a plan which Dr. Kidd had submitted earlier, which calls for building two new schools: a new Central School facility on the same lot, facing Seventh Street, and a new Lincoln Junior High School. Both motions passed 5-2, with Board President Bill Bates and Leta Herrington voting no. Bates said he voted against the motion because he was not in favor of demolishing both of the existing school buildings. He said he favored building a new Central School facility but not demolishing the junior high school at this time. Mayor Joan Ritter told the Lincoln Daily News this morning that although aldermen said they had received letters from constituents who wanted to keep Ralph Gayle Field, the only issue addressed by the council Tuesday evening was the sewer line itself. She said that, based on the relocation of the sewer line, "There was just not enough technical information given to the council, city engineer and sewer treatment plant manager for the city to give the school board a commitment at this time. "This is a major trunk line, six feet wide, all brick. Sewer plant manager Grant Eaton said the plans were not detailed enough for him to advise the council how to make a decision," she said. Dr. Kidd said he believed Wednesday night’s decision would be the end of the controversy over saving Central School. "We have to have all proposals in to the State Board of Education by April 1, and we have no more meetings scheduled until after that date," he noted. If approved by the State Board of Education, the new building projects will get 73 percent of their funding from the state of Illinois, with the rest coming from a local bond issue. Approval from the state board probably will not come before early summer, Kidd said. After that, district voters will have to approve a bond issue for the remainder of the funding, which would go on the ballot either in November or at the next municipal election in April of 2001. "The earliest time we could possibly see dirt turned would be the summer of 2001," Kidd said. The new plan calls for building a new Central Elementary School at the back of the present school lot, moving junior high students into the existing Central facility, then constructing a new junior high school. There are approximately 280 students in both Central Elementary and Lincoln Junior High School, Kidd said. [MARCH 16, 2000] Renovations to the restaurant at the Depot are underway and will probably continue until it’s time to open the doors for dinner on March 28th. The restaurant will offer a Sunday brunch, and in April lunch will be added. The restaurant will be open Tuesday through Sunday. Making the transition from solely a banquet facility to a restaurant has involved a lot of hard work and creative ideas. Owner Rob Orr, who has operated the Depot as a banquet facility for the past three years, said, "I didn’t want to significantly alter the building. I wanted to keep our flexibility and our options open." The major changes have been in the kitchen and banquet facilities. The kitchen utilizes one-fourth of the building. It includes rooms for cooking, food preparation, dishwashing, dish storage, cold storage, a walk-in freezer and an eventual wine cellar in the basement. Major remodeling is being done to the kitchen. Jeff Tendick, Orr’s partner and a European-trained chef, is very pleased with the custom-designed exhaust hood that pulls exhaust from the stove and other cooking surfaces without pulling the cool air and the heat out of the building. The eight-foot walk-in freezer was custom designed to allow for better utilization of the storage units that are in the freezer. There are 12 inches of insulation in the walls that surround the freezer and will help to keep the freezer very cold. One of the concerns with a building this size is trying to keep down energy costs. The Illinois Central area will be used as the banquet facility. The main area is sandwiched between two 80-ton 1933 Panama Limited Railroad cars. Doors have been cut into the inside walls of each train car for direct access to the center banquet room. Other additions to this area include a separate entrance from the street, a hardwood dance floor, handicapped-accessible restrooms, and a ceiling-to-floor divider that will break down the room to accommodate smaller parties. The train car on the northeast side of the building, closest to Chicago Street, has been gutted and is being converted into a bar and lounge that will service the banquet facility. The car on the northwest side will be used for meetings, dining or as overflow for the private events. The banquet facility can accommodate about 150 people. The more historic parts of the building will remain virtually unchanged. The Sunroom that looks across Chicago Street will be used for relaxed, family style dining. The Victorian room will be used for intimate, casual dining while the baggage room will be a lounge that will cater to patrons after work hours and may include a piano bar in the future. The Telegraph room will initially be used as a preparation station for the waiters, and the deck will offer outdoor dining on the west side of the building, overlooking the railroad tracks. The two red cabooses that are attached to the northwest side of the Depot house a rubber-stamping business that is not a part of the restaurant. David Katz, a former owner of the Lincoln Depot, is the contractor for the restaurant’s remodeling. Orr said, "Katz knows where everything is – the wiring, plumbing, etc. – and he has made some good recommendations on things we needed to do. It’s really working out well." But what is planned for the Depot’s menu? Tendick says, "We will have a living menu. It will change from season to season." French Mediterranean, regional American, Provence, Louisiana, South Carolina and New York cuisine are some of the selections that will be offered. "The menu will never be boring. It will take advantage of locally grown fresh products. There will be an emphasis on fresh, including fish and seafood. I want to offer the best of the world to you," Tendick explained. The wine selection will be held to about 30 choices. As the former owner of the Kingston Inn Restaurant in Galena, Tendick offered 11,000 choices of wine on his spirits menu. But the room in the depot basement that will be used as the wine cellar is directly under the railroad tracks, making long-term wine storage impossible. "The temperature down there (basement) is almost perfect. We’ll have to figure out some way to absorb some of the vibrations. As it is now, wine storage will only be about two months," he added. Imported English and German beers, single malt scotch and single estate coffees will also be on the menu. Within the next year, table coffee service will be added, whereby a patron’s choice of coffee blend will be brewed at the table. There will also be beverage-tasting opportunities. Progressive dinners are in the plans, too. Orr and Tendick have been in contact with other restaurant owners in town, and they envision patrons moving from one restaurant to another to partake in different courses of the same meal. This kind of dinner will also be coordinated with other events in town. 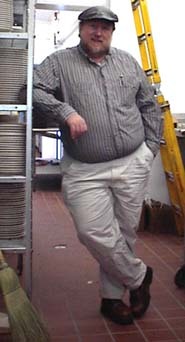 Tendick stated, "I foresee working very well with other restaurants in town. We have given and received very positive support to and from them." A staff of 30 full-time and part-time employees has been hired to handle the dinner hours. About four positions have been left unfilled. Additional staff will be hired once they open for lunch in April. 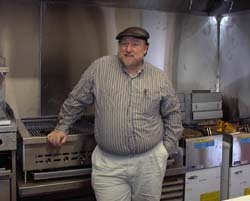 Dan Ellis, a local man who has worked in several of the Lincoln eateries, will be one of the cooks assisting Tendick. Lesa Jackson, former owner of Kindred Spirits, will manage the lunch shift. They will make their own desserts and breads. Jackson said, "I am really excited about offering customers an excellent dining experience and hope that everyone enjoys their experience at this historic restaurant." [MARCH 15, 2000] In keeping up with our increased readership, Lincoln Daily News has made some improvements to the site. It is now easier to navigate. Every article in the entire paper is accessible from every page. Just scroll down to the bottom of every page and see the index, which lists the title of every section. After reading an article you can click on the next column of choice and you will quickly jump to that page. This will enable YOU to choose what you read. Choosing to go back to the front page is now easier than ever too. Simply click on the Lincoln Daily News logo located on the top left of every screen. It says "back to front" and it will take you there. The Lincoln Daily News has been online now for nearly seven weeks. We have continued our commitment from the beginning: to research and report the news and commentary from our community in a truthful and straightforward manner. There are many exciting things happening in our towns in and around Logan County. As the days and weeks and months go by, we strive to maintain the things you have come to expect from LDN. [MARCH 15, 2000] Felons intending to commit a crime in Logan County should be forewarned that their criminal records are as close as the touch of a computer key. The two Logan County K-9 sheriff’s deputies will soon be receiving the latest in police technology. Thanks to $16,500 in drug forfeiture monies provided by Logan County State’s Attorney Bill Workman, the two K-9 units will have touch-screen laptops that will be mobile with the police unit. These computers will give officers instant access to anyone’s criminal record information. The new system will reduce the need for much of the radio communications between the officer and police dispatch, because the officer will have that information available through the high-tech unit in their own patrol vehicle. “Because of the successful drug asset forfeitures, I am able to provide the funding for this enhancement to the law enforcement community. It is through their hard work and dedication to the war on drugs that these funds were confiscated in the first place,” Bill Workman said. The money comes from cash and other assets that have been seized from drug dealers. Workman explained that when money is seized from drug offenders in the course of their prosecution, his office conducts a forfeiture proceeding. The cash or assets that are forfeited to the state become the property of law enforcement to be used to assist in the prosecution of drug offenses. In the past Workman has used these funds to update the computerization of the state’s attorney’s office, equip the prosecutors with up-to-date technology and assist in the overall prosecution of drug cases. “Due to the success of our drug prosecutions and seizures the last three years, we are able to not only meet the needs of our own office, but apply some of the funds to law enforcement directly. I feel it is a positive and productive use of these funds to put some of it back into the local community to fight drug crimes,” Workman said. Sheriff Tony Solomon expressed his appreciation to State’s Attorney Bill Workman for his willingness to share funding out of his drug forfeiture account. “The Logan County Sheriff’s Department will benefit by Bill Workman’s assistance and support of our agency. This technology will allow officers to access critical information immediately, and substantially increase our ability to protect and serve the public,” Sheriff Solomon said. [MARCH 14, 2000] Could a bed and breakfast—or perhaps more than one—be in Logan County’s future once again? It’s a possibility that the Lincoln/Logan County Chamber of Commerce and Main Street Lincoln are encouraging interested persons to explore. The two groups are sponsoring a Bed and Breakfast Start-up Workshop on March 30 from 8 a.m. to noon at Eckert’s, 123 S. Sangamon St. in Lincoln. The workshop will provide insights from experienced B & B operators and patrons, along with information about zoning, health department regulations, business plans, financing and marketing techniques. A $10 registration fee will cover the cost of materials and breakfast. Anyone interested may call the Chamber at 735-2385 for more information. Representatives of several area organizations said they believe the Lincoln area offers opportunities for those wanting to start such a home-based business. "Currently, Logan County does not have a ‘home-style’ place to stay," says Bobbi Abbott, Chamber director. She says that more and more travelers are looking for such accommodations for both weekend getaways and business trips. They find the advantages of staying at a B & B include the opportunity to mingle with other guests and to learn more about the area from their hosts, along with less traffic congestion, more amenities and sometimes lower rates than traditional accommodations. "I get calls from all over from people wanting to know if there is a B & B here," says Thressia Usherwood, executive director of the Abraham Lincoln Tourist Bureau of Logan County. "I think B & B’s could become very successful here. People love them." Usherwood thinks that as the Looking for Lincoln project gains momentum, more and more tourists will be coming into the area. The Looking for Lincoln project, funded by a state of Illinois Heritage Tourism grant, will identify important Lincoln sites and publish a guidebook so that tourists can follow a "trail" of places important in the history of our 16th president. "There is a wealth of Abraham Lincoln history here," Usherwood said. Sites in Logan County that will be listed in the guidebook include the Postville Courthouse, the Mount Pulaski Courthouse and the Lincoln College Museum of Lincoln memorabilia. She also noted that Lincoln is a popular stop for the Illinois Route 66 Association, which will be holding its Hall of Fame banquet here this year. According to Abbott, studies show that B & B patrons often spend more time and money in the community than those who stop in off-the-highway motels. 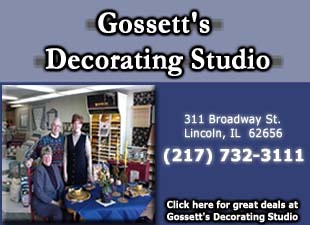 She notes that unique restaurants, antique malls and specialty shops are of particular interest to people who stay in B & B’s. "We have many small, local businesses that can benefit from B & B tourism. The Chamber and Main Street will help market our local businesses to these patrons." Wendy Bell, Main Street Lincoln program manager, also supports the workshop. "There are marketing opportunities through Amtrak and Main Street that do not exist in other areas. A bed and breakfast would complete the package of good food, interesting shops, and a unique place to stay." The March 30 workshop is designed to offer "information and inspiration," Abbott said. "There is absolutely no obligation. We’re hoping this forum will appeal to anyone with a curious to a serious interest in this type of home-based business. "We presently have two persons with serious interest. We’d like to attract a few more. Clusters of bed and breakfasts tend to draw more tourists than a single offering," Abbot continued. "The operators will eventually be able to put together attractive packages featuring unique travel experiences—riding the train, bicycling, or driving Route 66," she said.